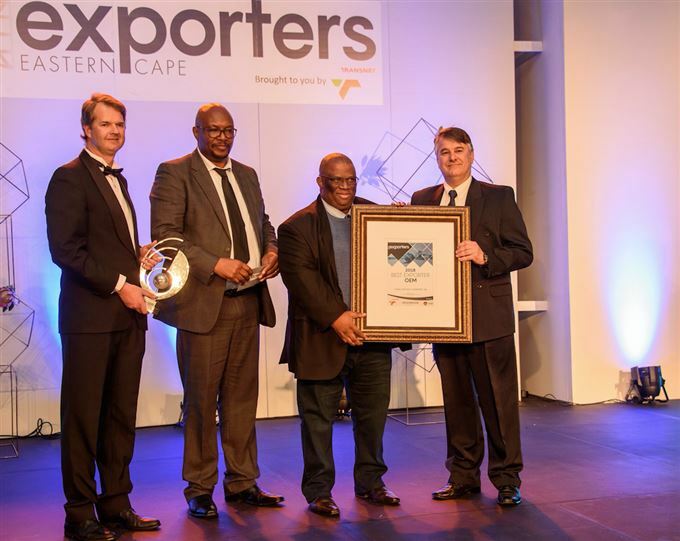 Ford Motor Company's Struandale Engine Plant in Port Elizabeth has once again been recognised as one of the Eastern Cape's top exporters after winning the 'Best Exporter OEM' Award for the third time. The annual awards are hosted by Exporters Eastern Cape, and acknowledge the top export companies in the province across various sectors by virtue of their investment, growth and job creation. This year's ceremony and banquet took place at The Boardwalk Hotel and Conference Centre on Friday 17 August. This is the third category win, for original equipment manufacturers (OEMs), for the Ford Struandale Engine Plant, having earned the title in 2013 and 2015, along with Merit Awards in 2016 and 2017. "Winning the 'Best Exporter OEM' Award reflects Ford's ongoing commitment to the Struandale Engine Plant as an integral part of the company's global manufacturing network," said John Cameron, Plant Manager of the Ford Struandale Engine Plant. "It is through the dedication and commitment of our employees that we have been able to develop and grow, and attract new business as a world-class supplier of machined components and fully assembled engines for the Ford Ranger and Everest export programmes," he added. Fully assembled Duratorq TDCi engines are supplied to Ford's Silverton Assembly Plant in Pretoria which produces the Ranger for export to 148 markets in Europe, the Middle East and Africa. The locally sourced engines are also used in the Everest SUV which is assembled for export markets in Sub-Saharan Africa. Additionally, engines are supplied to North America, India and China, with machined components - comprising the cylinder block, head and crankshaft - exported to Ford plants in Argentina and Thailand. "It is through our ongoing drive for excellence that we have been able to secure new business as part of the R3-billion investment in production expansion at Ford's South African operations announced late last year, ensuring our position as a key player and employer in the automotive industry in the Eastern Cape," Cameron stated. In March this year, a high-tech assembly line was officially opened for Ford's all-new Bi-Turbo diesel engine which will power the exciting new Ford Ranger Raptor to be launched in South Africa early next year. Final preparations are underway on the new line, with production set to commence in November. "The new engine programme, combined with the addition of a further 22 derivatives of the Duratorq TDCi engine to support new customer plants in Italy, Turkey and Russia, will see us continuing to break new production records for Struandale Engine Plant," he concluded.